Something that many of us have been longing for some time now has finally happened. 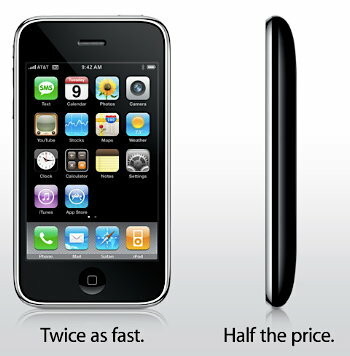 Apple has announced that they will begin shipping the new iPhone 3G as from July at a dramatically reduced price ($199 for the 8GB model and $299 for the 16GB model) compared to the “old” iPhone. It seems that the price will be subsidized by the mobile phone companies this time. you will only get it in shades of orange and all the icons will be replaced by Orange’s logo. it’ll probably cost a bit more than the announced $200 (that’s still bloody expensive!!!!!) so don’t yeah!! too much yet… But I almost thought you already had one. Didn’t you? Seems like the indispensable Geek Gear you’d saw your legs off to acquire. oh and do we have the maps with GPS thing here in mauritius? Great news, indeed. The new 3G iPhone almost makes me regret buying the Nokia N800. Will such a subscription be required in Mauritius too? If yes, will it be at a slightly more expensive than current pricing plans? And it appears that part of the reason behind the iPhone 3G’s substantially lower price tag is that the wireless carrier is subsidizing a portion of the handset’s cost—a common occurrence with other phones, but not the case with the original iPhone. It is known that in Mauritius that that the wireless carrier subsidizing a portion of the handset’s cost is not such a common occurrence – both in magnitude of portion and range of handsets, so the question that lingers is how will the selling price of the iPhone be affected in this regard? (will it be a notable exception or a pitiful repeat?). This aspects relates to the one above, but I *sigh* hope *sigh* a good balance is found between the two, for truly the iPhone is an amazing product. did u check those prices???? Rs8k for the 16 Gb iphone seems kinda cheap nah? after hearing all the crap about iPhone lately, i wonder whether i still even thinking of owning one :D.
Orange still needs to sort out the issues with its mobile network and QoS parameters for wired Internet. I wonder what the QoS will be like for 3G…time will tell….but i am starting to save to get me one!!! And hopefully by that time we might have better mobile networks! But at only $200, isn’t this too much a bargain? How customizable will it be? That’s just one question to begin with. @avinash: No, it is not infinitely customisable. In fact, it is not customisable at all unless you jailbreak it, as Apple have a lot of constraints for developers who wish to write applications for the iPhone. For example, applications can be sold only via iTunes Music Store. but you still can’t iron a shirt with it. well maybe there is an extension you can plug in for that. It’s true that the iPhone imposed some drastic limitation on developers previously but since the release of the SDK and the new App Store, things are looking exciting. No java support, no native flash support, no multitasking, no background processes & much more (couldn’t read the whole list of things). My latest book purchase, Cocoa Programming for Mac OS X (Third Edition), was delivered at the office last week. I’m itching to get into it. I’ve got to finish this other project first, but I’ve been reading up whenever I can anyway. Not getting much sleep lately! Nothing like an awesome device to make you want to write software for it. Apple have a winner on their hands. It took nearly a year to sprout 3G capabilities, but we’re finally there. With iPhone 2.0, there are 3 ways to officially (i.e. without Jailbreak) get applications on an iPhone: The AppStore (via 3G, wi-fi and iTunes), Enterprise distribution (for distributing in-house applications through a company’s Intranet to authorized phones via iTunes) and Ad Hoc distribution (to a maximum of 100 phones via email and upload them via iTunes). True there’s no flash support, no multitasking and background processes for 3rd party apps. But the trade-offs make sense for mobile devices. Background processes can take a lot of unnecessary CPU cycle or eat battery life if it is not properly terminated. In such cases, the user would need a Task Manager (like in Windows Mobile), to manually shutdown an offending app to free resources. Also multitasking on the limited screen estate of mobile devices is not totally justified as most users will run only one application at time (play a game, watch a movie, read emails or browse the internet). My understanding is the announced price is the one that you get when buying a service plan from an operator. Abroad, you can get cheap phones provided you subscribe to, lets say, a yearly service. My knowledge about this subject is limited. Perhaps Eddy who is living UK can englighten us about cellular service plans in UK? $199 and $299 are the subsidized prices. In Mauritius, we’ll be lucky to get much change from Rs. 20,000. @Ajay: Depending on the service plan and duration of contract term, you can get the phone either for free, or at a discounted price. When the contract expires (12 months or 18 months), you can renew it with a phone upgrade, or you can keep your existing phone and take a discount on the service plan instead. Personally, I have been using a Nokia 6630 for years, having opted for a discount on the same service plan instead of the phone upgrade. My colleagues are baffled how I can spend less than GBP 15.00 on mobile charges, including 3G. The trick is to stack the discounts year after year and to use the saving to buy a SIM-free phone. On the other hand, my wife upgrades her phone every year and passes on the “old” one to relatives in Mauritius. Would it not be more comfortable to browse the net on a computer if you are at home? @avinash: I think that my reply to Ajay might have been swallowed by Askimet. Can you please check? It all depends on what you access, I guess. Personally, I am not bored at all. My MacBook Pro is all over the place, sometimes even in the garden. But, I still find a handheld device handy when I am out. Bored while my wife is shopping, I fire up the Nokia N800 and connect to the Internet via 3G. I don’t move my MacBook a lot either, but I don’t surf in the toilets. It’s probably the only place in the world where I am 100% of what I am doing. I must check if similar plans exist in Canada. For sure, I can get a subsidized phone for cheap or for free if I get a plan, but I don’t know about the discount. I am currently using a prepaid service. My workplace is only 15 minutes away from home and I therefore don’t need 3G yet. Are not the phones passed on to relatives locked ? @patrick: I don’t know about voice call plans, but Canada has one of the most expensive data plans in the world. Amusingly, the data plan from Emtel is the cheapest that I have ever used. I unlock the phones before giving them away. @avinash: Not telling you what to do with your own blog, but why is Abouna’s comment even allowed? Voice call plans are okay, but data plans, like you said, are very expensive. Once again Apple shows itself to be closer to the Microsoft business ( high profit- low product value ) model. Ok I am a bit peeved cause I do own the full price original Iphone. But to me the main reason of purchase (admittedly) was to own something a bit exclusive, after all, it’s by no means the best phone on the market. By making it cheaper and more accessible to the MASS MARKET, Apple HAS to be lowering cost; and that HAS to mean lower quality parts (plastic over metal?) – and there is no one on earth who can tell me that Apple are going mass (again) for the love and support of there ‘followers’ its purely business and a cheaper product… of course selling out /going mass is not a new business model but don’t be fooled into thinking the product is the same thing at a cheaper price. The original Iphone with all its failings was a classic in business AND Product development, but the new version is simply the difference between Giorgio Armani and Emporio Armani – the latter being nothing more than something mass produced in China somewhere. Time to look at a real phone methinks…. that new Samsung touch screen F700 looks dapper…. any1 wanna buy a real second hand Iphone? I was once following Data Structure classes lectured by you. I have an iphone. Abrand new one my sis just sent me from UK. But I’m unable to connect. Everytime it tells me “You are not a subscriber of EDGE”, or “Could not connect to EDGE” things like that. Can you advise me what to do? How do I get connection to a Wi-Fi? What are the steps I should take? Thanking in advance. Unfortunately, I can’t really help you concerning the iPhone because I don’t have one. Maybe someone more familiar with it can help? Based on what you describe, it’s the old iPhone. It doesn’t support 3G, and EDGE isn’t available in Mauritius, as far as I know. It doesn’t support Wi-Fi ever. Congratulations! You’ve got an expensive paperweight! I meant to type *either* and not *ever*. Woopsie! I stand corrected about the availability of EDGE in Mauritius (thanks, carrotmadman6). If you are very determined to surf over your existing Internet connection instead of the costly EDGE, consider buying a femtocell device. I noticed some models were available from computer shops in Mauritius. Does it? We have one in the office for testing, and we never found the WiFi feature; we even bought an iPod touch to get WiFi! But then we have loads of pre-commercial devices. The iPhone 2 does support java midp? And on what O/S does it rely on? The iPhone is the only phone that doesn’t support Java Midp – no java games or apps then. It uses OS X, way behind Windows Mobile & Symbian. Yeah, only Orange would be selling it & you wont be able to use Emtel coz it will be probably be locked if subsidised. It’s not Safari mobile – it’s a fully-featured Safari, but you cant install any other browser. Avinash would then make software for the iPhone 2 and then post donwload link for us!! Youpi! Does anyone know the actual date of when it will be released in Mauritius? But the GPS along with Google Maps, that’s not certain coz there are currently no Google Maps, with detailed street view, for Mauritius. Would ya know the approximate date for launching in Mauritius?? Seems even Orange’s Mauritian web page contains no single detail IRO Iphone at all !! Mauritius has become the first country to offer nationwide wireless internet access, as part of its quest to become a regional technology hub. The network gives contiguous wireless broadband coverage of more than 100 square miles, enabling the island’s 1.2 million inhabitants to access the internet via a submarine cable installed three years ago. The wide-area wireless broadband system uses smart antennas to boost performance and can be upgraded to 802.16e WiMax once the new standard is approved. “We looked at other high speed broadband options and, in our scenario, DSL and cable modem were not viable options,” said Rizwan Rahim, chief executive at ADB Networks which was responsible for the roll out. The country is offering incentives to encourage IT companies to set up business as part of a move away from relying on agriculture and tourism. These include lower rates of corporation tax, increased tax breaks on IT purchases and up to 50 per cent discounts on personal tax rates for IT staff. Mauritius has also tightened up its computer crime laws and begun offering widespread IT education for its citizens. The moves mirror those in Dubai and some other Gulf States to attract IT jobs. Is it true ?? so when I’ll get my Iphone I’llbe able to connect anywhere, anytime ?? :D:D ?? Does it work well with the local 3G networks? Did you have to unblock it? As I know by Apple IShop its will come around September. The French mobile operator Orange will sell the iPhone 3G unlocked. The 8 GB version will make you about €509 (802$ !!!!) poorer and for the 16GB iPhone 3G you will have to cough up 609€ (960$ !!!!). Belgium is expected to have to pay roughly the same, this is due to the fact that selling Sim-locked devices are illegal. The iPhone 3G will be available starting from 17th of July in France. Another interesting fact is that Apple will require any user that bought a unlocked iPhone to register their IMEI number on a special list. So when you need to upgrade to a new firmware your iPhone will be automatically unlocked. If you buy a jaibroken Iphone it’ll most surely get locked as soon as an update is installed. Best thing is to wait for Orange to launch it. For iphones bought already unlocked (lotsss of money) it requires that you register the IMEI so that product upgrades do not fk up your phone. just called Orange yesterday, I chose to connect to the section responsible for commercial information. They did not even know what was the Iphone 3G :O !! They hought I called for info about 3G coverage LOL !!! so… still no news about the launch of the 3G Iphone .. ?? Just called Orange, they told me it would be released very soon but could not tell me exactly ehrn because it was not official yet. I asked it it was more like september or october and told me it was gonna be real soon. So we may assume it will be september :D !! Just called on Orange customer care service (203-7503) and they informed me that they planned to launch the Iphone 3G around December but it was not yet official :O :'( !! I can see a lot waiting for the iPhone to be available in Mauritius. In Canada, it’s available already, but I don’t want one. Life is not fair, is it? Hi, am accessing your blog through my mob phone, is there no way to get rss for this entry only? Got the info that iphone has been received and is on test. They won’t release it this month. Thanks for this Jo. Let’s hope for the best. Just to tell you that Hong Kong has got the iPhone 3g fuly unlocked (officially)… but at a high price… around Rs21000 :S ><! I’ve just been told that the iPhone 3G will arrive in Mauritius at the end of October and will be officially launch in November. I don’t know anything about the price. Hrem, can I know where did you heard this news? Great :D !! I can’t wait !! A friend of mine got if from UK, seems it has to be unlocked :O !! ok guys, seems like Orange is serious about launching ipgone 3g soon, they even put back the add on their website :D:D !! Let’s hope the price is reasonable. I don’t want to sound condescending but there is something Mauritians need to realize: Réunion is France. It is a rich country which can subsidize a lot of things for its taxpayers. 1.5h of talking time per month? That’s 3 minutes per day! let it come with its price…. I’ll ask. But it seems that there are technical issues right now which might explain the lateness. Iphome launching on Friday, 13000 Rs with a 2 years contract plan. No info on the bandwith and talktime. Where did you got this info? It seems that Orange will not give max dl per month as they did in France. We will have to make tests and fight for a real 3G service. Don’t waste your end of year bonus if you have any, This information is real. It would be a special Christmas deal on launching of MT 3G network. hey, but when will it come out? You said Friday, but there’s no pub… And what the F… this plan!!! Rs22,000 is way cheaper than the total cost of this plan… At least rs1000 per month… And yeah the iPhone 3g IS in Mauritius but Orange does not want to sell it. *cough* some kp*g employees have their iphones working fine with a certain fruity isp. I have been waiting too long for buying the iphone 3g. I juste bought one fron a dealer… It’s awsome :-) It has been unlocked but not jailbroken… Do anyone know how to configure visual voice mail on iphone? ok . pubico is the agency that is preparing the add…. the Lauching is postponed by 1 week…. They have launched the christmas deals already but they want a special event for the iphone. Don blame me…. i m not the marketing manager…. but my infos are true and correct. THE IPHONE IS ALREADY AT MT. I don’t know myself how they unlock it (hardware or software unlock) :-( But the iphone is working fine… I have no problems at all… ohhhh by the way, sometimes when i get a message, there’s no sound… some minutes later, the sound comes back… strange!!!!! How much do you think the contract will cost? only 1000 units will be sold by MT. 13000 Rs with a 2 years plan!!! to armand : are you sure about the price or its just a random guess? well, i really can’t wait to have it here on 19 dec, just hope its within my budget,lol..
the launch will be on Friday. But the sale will start on Saturday. Please check with Orange Mauritius. Bon get sa.le 19 lancement si je me trompe.b ki couyonad prix zot p discuter.mo cner zot p dne zot l’opinoin tou sa mais pa exagerer si pa ki.Cmt to cner ki samedi ki p van sa toi Fharad? ?to travy Telecom?? ?Orange shop??? ?lor site la mem pa meter quand pu van sa.donc ki pu chek ek Orange si pa ki.alors atan cmt tou dimoun. There’s only one way – buy an unlocked iPhone on eBay. Oh, btw for those who still want to buy your iPhone (even though you are at loss), don’t update it to the latest firmware if you want to unlock it. & don’t QuickPwn (Jailbreak) it as well. The iPhone Dev Team (responsible for the software unlock app) have stated on their blog that they’ll be releasing their unlocking app on the eve of New Year. can anyone tell me the actual price of iphone 3g? because according to JO, the iphone would cost 43000 at the end. n how are some people using the older version iphone? are they using a pre paid sim card ? so what if i ask some1 to bring the iphone from another country? Bloody expensive I would say. Rs 45,975 over 2 years for a 16Gb iPhone with the cheapest plan is waaaaayyyyyyyy above what I am willing to pay for a phone. The HTC Touch HD is a great phone in terms of specs, but underneath TouchFLO, it’s still WinMo 6.1 – not the best UI you’d want. & I bet it’ll be equally expensive. think is a good package if you use them but 200 sms is way too far. There is no internetal storage in the htc touch hd. i am buying the 16gb iphone on monday. Itunes can be configured with a U.S a/c, simply try to “purchase” a free app, then it will ask you to log in, just sign up then. Its important to try to get an app first. On payment Screen just select “none” and complete remaining fields. that’s it. You will be able to download all free stuff. Now you may, just like me, jailbreak it (which includes instaling cydia and installer – included when jailbreaking) and add sources to get apps from. I should have taken it when my friend went to Hong-Kong,was 18k for the 3g 16gb and i thought it was expensive,pff..
Got all apps free without itunes. 39k an iphone 3G 16 Gb??? lol @ Jim!!!! 39k means Rs39,000 !!!!! LOL ^_^!!! I thought k = hong kong dollars. wep, rs35,000 at i think Zeid(not sure about the name) in rose-hill and rs39,000 at CT zone in Happy World House port-louis..
A friend told me that the unlocked and packaged iPhone 3G is being sold Rs. 14000 + VAT + 1 year warranty @ Distritech, Rose-Hill. Hi, i have a friend who had iphone 3g 2.1 which i updated to 2.2, jailbreaked ( i think each of you knows how to do it by now) and installed a small app to remove the sim lock as turbo sim stopped working after the update. Every one can do it at home in a few minutes. How to activate visual voice mail for orange ??? the iphone 3G”S coming to mauritius aug 9..
of course we can bro.. I had lots of fun using my Iphone 3G, waiting now to upgrade to 3G S very soon. But they are not telling if the 3GS has been released. Hi, will Orange offer iPhone 3G users an upgrade to iPhone 3GS like other countries do? In reference to buying apps from app store.Thats not necessary : Jailbreak the iPhone which you have to if you want to use an Emtel Sim like i do :) and get apps from cydia instead. my question is: can i get an account on apple store if my iphone is jailbroken? because i know that the update for the os software for jailbroken iphone must not be done on itune..otherwise it will be reset and the phone will be no more jailbroken. I have been thinking of looking for a phone that allows dual sim cards for my next phone as this would be useful when i am travelling abroad. anyone got an idea of the iphone price in mauritius ?? There’s no need 2 repair ur iphone!!! Ur iphone is just gone in DFU or recovery mode. It is very easy 2 came out of this mode..
Have u recently update ur iphone os to 3.1.3? Anyone of you know who repairs iPhones in Mauritius. I got one I bought in Dubai and my LCD has lots of stuck pixels on the screen which is really annoying since it covers at least 10% of the screen. Jean Marc, we can repair the iPhone, just pop by our Showroom in Curepipe or give us a call…details are on the website. can someone help me please?????????????? Any1 having problem with there idevice should call me.I will fix it for u. Good news to iPhone Fanatics!! 1. Update your iPhone to version 4.0.1 from iTunes (9.2.1) or if you have downloaded the IPSW file manually. 3. Finally, you will find a small icon “Cydia” on your iPhone desktop. Click on the icon and enjoy finding free softwares!! Important notice!! This will not Hacktivated your Iphone!! I have already jailbreak my iPhone 3G with previous firmware version 3.1.2. The new iPhone 4.0.1 works great! Nice interface and more performant than previous version!! All my previous applications works great without any issues!! Note: The link “jailbreakme.com” is currently exhausted and try to reconnect again and again! I’ve bought an iPhone 3G from Malaysia. It worked well for a month after jailbreaking (redsnow + cydia). Recently my iPhone went out of battery. Ever since it displays connect to iTunes. Restoring on iTunes doesn’t work either. sometimes i play so much java games that i loss track of time :’.